Walletdoc's new service offering gives small business customers an additional payment option. Walletdoc hopes its new money collection service will improve non-face-to-face card transactions between suppliers and customers, says joint-CEO Leonard Shenker. According to Shenker, many businesses manually collect card data from customers and manually process these card details into a point-of-sale machine to collect payment. He believes this is not operationally efficient. As a result, the company decided to expand its bill payment services by introducing Walletdoc Business. It enables merchants to collect money from customers using online credit and debit card payments on invoices and statements. To use the payment service, companies must send their bills to Walletdoc, which will then send the bills to clients in real-time with embedded debit and credit card payment functionality. The invoice is turned into a virtual card machine, offering card as a payment option to clients. According to the local fintech start-up, clients still have the option to pay the bill via EFT if preferred. In addition, the bill recipients don't need to download or be existing Walletdoc users to make payments. Shenker explains: "Consumers are cash-strapped and this creates cash flow issues for businesses. By allowing consumers to pay accounts online and instantly by credit and debit cards, our merchants have noticed a dramatic increase in the speed and volume of payments which has improved their cash flow. "Our network of payable billers is now growing exponentially with our new offering for all businesses which seek a smart solution to collect more money by offering online card payments," he adds. Furthermore, Walletdoc Business notifies merchants about which bills have been received, opened and paid. "Each payment is automatically referenced to an account or invoice number so there are no unallocated payments, reducing the administrative burden often associated with incorrectly or unreferenced EFTs. Customers are also sent reminders for payment prior to the due date." In terms of security of the payment system, Shenker says users' data is protected with bank-level encryption. "We are payment card industry and data security standards compliant. We are POPI compliant. Mobile transactions require either fingerprint or PIN authentication. We are registered with the Payments Association of South Africa in terms of the directive for payments to third-persons." 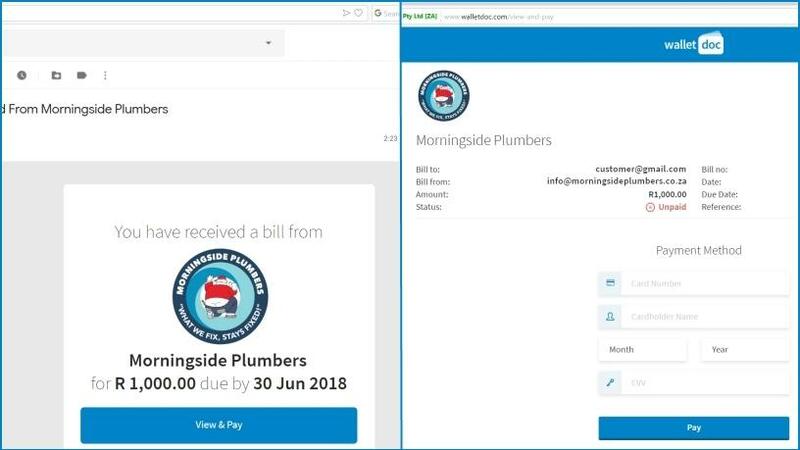 Morningside Plumbers is already using Walletdoc Business, with the company's Lior Solomons stating: "Walletdoc has given our customers an additional convenient payment option and allowed us to eliminate our traditional speed point in the process. On the first day of implementation of Walletdoc, we received multiple payments through the Walletdoc system within two hours and our customers continue to use the system on a regular basis."